Links allow you to use text or images to link a site visitor to another page or file either on your site or on another site. 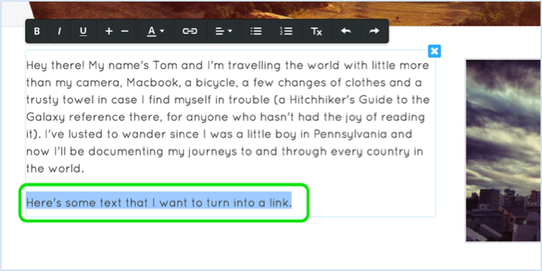 To create a text link, first highlight the text you want to use for the link. Link to a page on another site. You can even choose to have the link open in a new window (so that the visitor is not redirected from your own site when they click it) by checking the provided box. Link to another page on your own site. Just select the page you want from the drop-down menu. Link to a file so it can be downloaded. 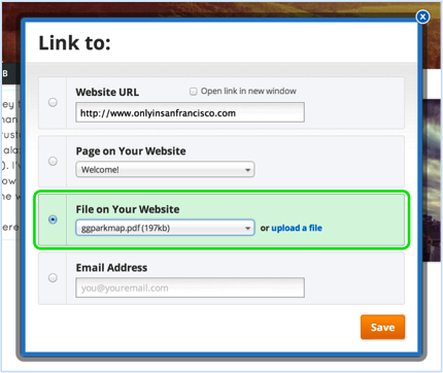 You can select a file from the drop-down menu or upload a new one using the blue "upload a file" link. Link to an email address. This will cause the visitor's mail program (like Outlook or Apple Mail) to open so they can write you directly. Note that if the visitor is not using one of these programs, the link won't work and they'll just need to copy your address or use a Contact Form if you have one on the site. You can also hyperlink to a specific page section. Use this feature when you want to bring guests to a particular spot or section on a page of your website. For instance, if you have a page about social media with a specific section on Twitter feeds, you can link directly to that section of the page; your visitors will not have to scroll down to reach the desired information. We explain the steps below, but there is also a great video tutorial provided by DivTag templates on their site. It might do a better job at explaining this. You would, of course, replace "Twitter Feed" with whatever words you are linking to. Next, publish the site and click on the page that you want to link to (i.e. "Social Media") and copied the URL (i.e. http://kaburns1.people.ua.edu/social-media.html). Then go back to the words in the site that you want to use as your link - such as "Twitter". 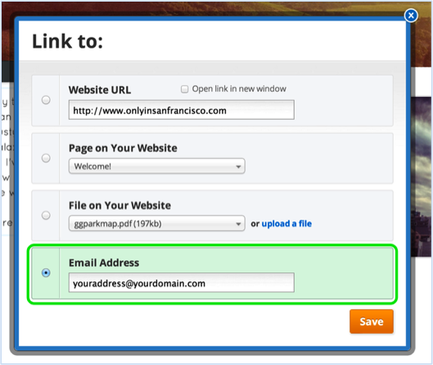 Highlight it, click on the hyperlink icon, and choose the URL option. Then paste in the url you just copied and add the #divID at the very end (to get, for instance, http://kaburns1.people.ua.edu/social-media.html#Twitter Feed). Spaces are okay! When you've created your link, click Save and then Publish the site to test it. You can also click on any link in the editor to see where it leads and to change/remove it if needed. Another kind of link is the Picture Link.